One of our favorite foods is cheesecake so we thought, why not make Keto Popsicles using cheesecake filling for a fun twist! 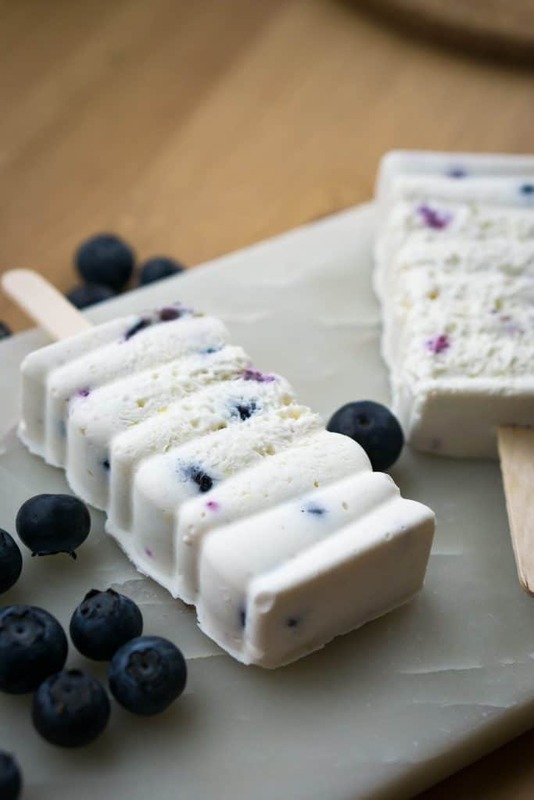 We also amp these low carb popsicles up with blueberries, lemon juice and lemon zest; a perfectly sweet and tart combination to complement the creaminess of the cheesecake. It's one of the easiest recipes you're going to ever make because all the real work is done by the freezer, transforming a delicious cheesecake filling into perfect, for all times of year, popsicles! What Are The Most Keto Friendly Fruit? Well, to start, you've got blueberries, which is why we used them in this popsicle recipe! And, if you really want to simplify the answer, all berries whether it be strawberries or blackberries are fine to eat on a keto or low carb diet. They can add up though, due to the sugars, so it is important to weigh them out and track them when you choose to indulge! We've found that blackberries have the least sugar per 100 grams so that could be your best option when choosing to eat fruit. Go ahead and change up the fruit in these pops and let us know what you think! The Most Indulgent, low carb Freeze Pops! We've made popsicles before, but nothing ever as indulgent as these. You almost feel zero guilt since they are low carb and in freeze pop form! Eating these brings me back to my childhood when I would eat the freeze pops that you would buy in bulk and came in six different flavors. It was a simpler time, and although sometimes simple is best, after growing up you figure out that the most indulgent foods are the best! And, if you want to indulge in these you can use the same popsicle molds we used in the video to make yours! If you buy multiple they stack great, taking up the least room possible in your freezer! If you're also a fan of cheesecake, but prefer it unfrozen, in pie form give our easy, no bake cheesecakes a try or our pumpkin pie cheesecake, which s always a hit during the fall time and holidays! You can even use this cheesecake filling to make a normal cheesecake by adding a crust and letting it set in the fridge! We've given you the perfect base with these keto popsicles so add in your favorite fruit and flavors and remember what it's like to be a child again! Recipe can be quickly added to MyFitnessPal - Search "KetoConnect - Keto Popsicles"
Combine the room temperature, sour cream and heavy whipping cream in a large bowl using a hand mixer. Add the swerve, vanilla extract, stevia, lemon zest and juice. Combine. Add half the blueberries to the mixture and mash them with a spoon. Add the rest and combine with the hang mixer. Divide the mixture between 6 popsicles and freeze for at least 6 hours, but preferably overnight.